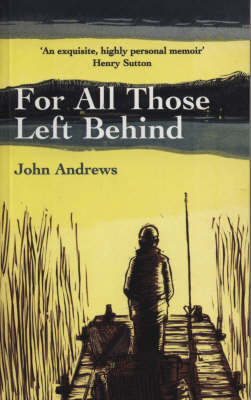 "For All Those Left Behind" is a book about fishing. It is also a book about grief, loss and, ultimately, identity. It's about the compulsion to escape the hectic pace of modern life and the search for peace on the margins. When his father died in 1992, John Andrews thought there was nothing left unsaid between them, but as the years passed he came to realise that perhaps something had been left undone, unfinished. He began a subconscious search for these abandoned threads by starting to fish again, a pastime he had pursued with his father until the age of 15. What began as a good excuse to get away from the London rat race gradually developed into a personal journey that was to take him back to the very heart of the relationship between himself and his father. In 1999, Andrews was made redundant from Creation Records, home of Primal Scream, Oasis, Teenage Fanclub and others. Told he could walk into any job in the music industry, he decided instead to start writing. In haunting prose, Andrews describes his search to come to terms with his loss, taking the reader on his personal odyssey from Skye to Ireland and from Cuba to the green fields of Albion. "For All Those Left Behind" is a deeply moving memoir and a paean to the redemptive powers of the tranquillity and joys of fishing.